There has now been an official English translation of Nintendo's notification, which advises that the fix in question will be an application to download from the eShop; this will then restore corrupted save data. 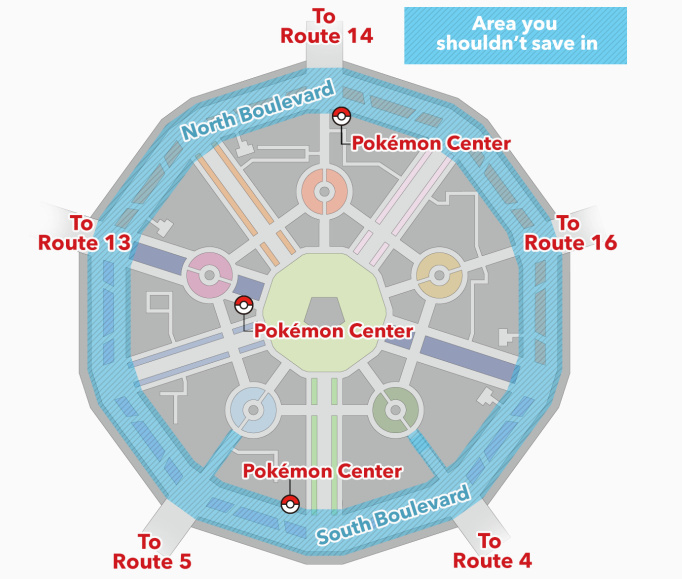 There's also an English version of the map, showing the blue areas to be avoided when saving your game — thanks 123akis. Earlier this week we reported on a game breaking bug in Pokémon X & Y that was affecting some gamers in Europe and Japan; it was discovered that — occasionally — saving in Lumiose City can cause irreversible corruption of save data, forcing the unfortunate players to start all over again. Nintendo has now acknowledged the issue and advised that it's working on a fix. Posted on the company's Japanese website, the message — allowing for some quirks in translation — suggests that work on a fix is under way for those that have experienced the problem, with a "few days" apparently mentioned though, to be safe, let's just treat this as a case of "as soon as possible". The post acknowledges Lumiose City — or Miare City in Japan — as the source of the issue, with advice to save in buildings such as the Pokémon Centre. The map below reportedly shows areas that prompt the bug. As mentioned above, the fix will apparently deal with corrupted files, so if you're happy to wait you may not have to restart the game. We'll keep you posted on further updates. They should have called it Glitch City. I wonder if I can find MissingNo while the game is still glitchy. I don't understand any of that! "Le grill"...? What the heck is that?! And yea, there was much rejoicing across the land. Pity the people who re-started their games. But well done Ninty! Crack-on. Not going back to this until fix is available. Well I'm glad Nintendo Europe and Nintendo America are on the case. Seems like a start to a bad Creepypasta. but how about the easy fix... dont save in the city yey problem solved? Made sure to warn all of my friends about this. Thanks for the updates as usual, NintendoLife! Good to know they're fixing it! Although you can get around it, it's much better if they just get rid of the problem. Nintendo sure is getting good about fixing these things! I like to see that. 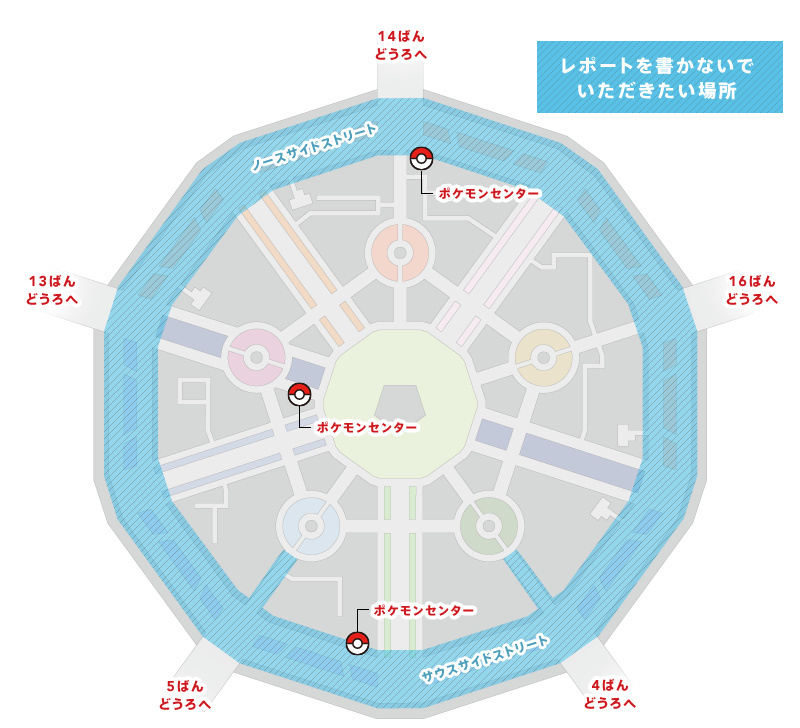 Hmm.. correct me if I am wrong, but aren't the map "pokeballs" locations read as "Pokemon center" (the location between route 4 and route 5 does indeed look like one). Wow, all that time wasted. Good for the people that are affected by this. I don't personally know anyone that has had any problems with this, but I know I'd get annoyed if this happened to me. I had Silver's save battery die right after I beat Red on Mt. Silver. When I found this out, I was super grateful for my habit of saving inside buildings. Still, I'm glad Nintendo is fixing this pretty severe bug. I'm getting Pokemon X today. Hope this game breaking bug goes away. It happened to me with Zero escape. I've saved in Lumiose several times and nothing happened to me. Maybe it's more specific than that? @MetaRyan I'd imagine the people affected by this would've already binned their game in frustration. Have people heard about saving outside Lumiose city? Apparently not. Saves seem to be safe unless if a Taxi is in screen or moving past as you save it. but yeah i'd stick to inside the pokemon center in that town, i'm avoiding saving anywhere in the town for now and i've had no issues. I heard rumors that it could possibly be solved by pressing home, or turning off the WiFi toggle. unsure if it has any basis, but it could kickstart some things. I've noticed long load times for transitioning onto the 3ds' main menu when i press home whilst playing Pokemon Y.
I've saved in Lumiose City a few times already before hearing of this bug and all is well. I'm not saying I'll put myself at risk anymore, but I don't think people should let this issue stop them from buying the game. It is very easy to NOT save in one specific location of the entire game. I thought this was EU and J games only? Hopefully the next batch of carts contain the fix. (Dunno that they do that these days though). Does this immediately corrupt your save data, or is the data only corrupted if you save there and then turn the game off and try to reload it? I save my game A LOT! And I know that I saved in Lumiose City about 10 times, but I rarely turn my 3DS XL off completely and when I'm involved in a game, I usually don't turn that title off unless it's to check street pass or Swapnote. I also saved outside of Lumiose City multiple times in the same play session. Just wondering. @MF_MaxiMillion LMAO... love it! I didn't understand that setup either. It's for the 3DS but it works best in 2D and if you turn on the 3D in a battle, the framerate drops dramatically. Oh well, I'm still really enjoying the game. I read in a forum (sorry can't remember where exactly) that if you accidentally crash the game like this you can remove the sd card, reboot the game and save somewhere else. @ShadowFox254 Lumiose City is only about 2-4 hours into the game, but if you have been grinding then it could be much more time, but grinding before then would be worthless. Since you need another badge to control Pkmn above level 30 and this game has new settings in place to ensure that grinding is not that necessary anymore. @Xomitsious Would that work with the Physical version? If you have the game synced to the Pokemon-GL.com site then your save is backed up online. I wonder if they could restore it from there somehow? I discovered this post accidentally after I saved in Lumoise City...good timing, eh? @Xomitsious Nice to know. Hopefully I never have to bother with this issue. I am too afraid to even go to Lumiose city after the news. I am too cautious. @123akis put a link to the english map. Beat me to it, i was about to comment that the map tells to not save in the blue area. We can't save here! This is Bat Country! Nintendo just posted prob. on pokemon.com. They said they will make an "application". Why not an update/add-on.